Exercise is essential for people suffering from rheumatoid arthritis. It is a safe and low-cost way to reduce pain, build muscle, and increase flexibility. If stiff joints are keeping you from seizing the day, it may be time to get on your feet and get moving. Exercising for your arthritis does not mean you have to become the next Lance Armstrong or sign up for the Ironman Triathlon. A bit of moderate exercise may be just what you need to ease your pain and protect your joints. You may think that exercise will make your arthritis symptoms worse, but that is just not true. If you do not exercise, your joints are likely to become even more painful and stiff. You need to exercise to protect the strength of the muscles around your bones. Without strong muscles, your joints will experience a lot more stress. Similarly, a lack of exercise makes it harder to keep off the fat. If you cannot maintain a healthy weight, those extra pounds can put added stress on your joints. 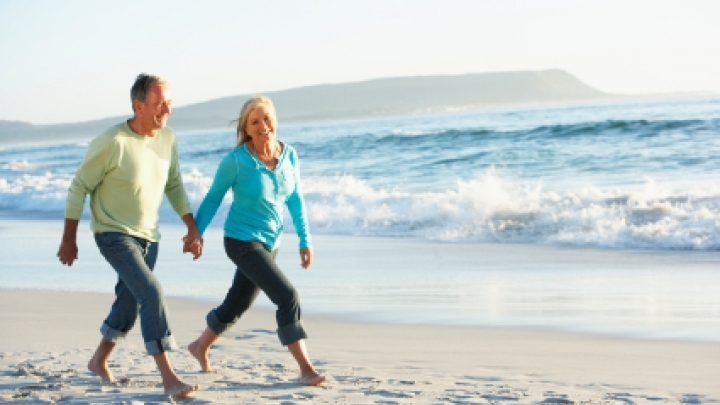 Exercise is not only a part of treating your rheumatoid arthritis. It is also good for your overall health. People who regularly exercise reduce their risks of heart disease, diabetes, and obesity. Exercise makes people happier and feel better about themselves. Altogether, exercise can lead to a longer, healthier life. While exercise is safe for people with rheumatoid arthritis, you will want to check with your doctor before you start your physical activities. Your doctor or a physical therapist can help you figure out how exercise will fit best into your current treatment plan. They can find what types of exercises will give you the most benefit without adding to your existing joint pain. Maintaining or improving your flexibility involves both range-of-motion and stretching exercises. Having good flexibility will lead to better posture, a lower risk of injuries, and better function. Range-of-motion exercises are activities in which you move your joints through their normal range of movement. In these types of exercises, you gently extend and bend your joints as far as they can comfortably go. Such exercises may include raising your arms above your head or rolling your shoulders back and forth. These types of exercises should usually be done about 5 to 10 times per day. Stretching is an important part of any physical activity. The American College of Rheumatology recommends that arthritis patients do stretching exercises at least three days a week with each stretch being held for about 30 seconds. There are quite a few ways to do your flexibility exercises. Yoga, for example, involves both range-of-motion and stretching exercises. These exercises are a little harder and take slightly more work. They are designed to increase your muscle strength, which gives you more joint support and takes away the stress from painful joints. Strengthening exercises will reduce the bone loss related to rheumatoid arthritis, inactivity, and the use of certain drugs like corticosteroids. It is recommended that arthritis patients do one set of 8 to 10 exercises for the major muscle groups of the body about 2 to 3 times per week. These workouts may include resistance exercises like raising a limb against gravity, lifting small weights, or pulling elastic bands. Some patients may find that moving against water gives them enough resistance. These exercises are the most beneficial to your overall fitness. They can improve your heart and lung health, increase muscle function, help keep your weight under control, and give you more energy. Aerobic exercises also can improve your mood and help you get a better night's sleep. Aerobic exercises that are safe for arthritis patients include walking, aerobic dance, water exercises, bicycling, or using equipment like stationary bikes and treadmills. It is currently recommended that people with arthritis get at least two and a half hours (150 minutes) of moderate physical activity per week. If possible, this amount of physical activity should be spread throughout the week. Body awareness exercises are designed to improve posture, balance, a sense of joint position, coordination, and relaxation. Even though it is possible to achieve some of these improvements through the other three types of exercise, sometimes a different activity is needed. Both tai chi and yoga involve principles of body awareness. When it comes to exercising for your arthritis, not all activities are created equal. Some exercises can put too much stress on your joints. These activities - which are sometimes referred to as "high-impact" - include lifting heavy weights, jumping jacks, or jogging. These activities are not totally forbidden for rheumatoid arthritis patients. Just remember to stop if any physical activity is causing you too much pain. Then talk to your doctor about changing your exercise plan. Now that you know what types of exercises are out there for arthritis patients, you may be asking yourself, "When and where do I exercise, and how do I get started?" Let's answer the when and where questions first. The right time of day for exercising is not the same for everybody. You have to find what time works best for you and deals best with your specific pains. The important thing is to establish a routine. If you find that you have problems with morning stiffness, you may find that gentle range-of-motion exercises before bed help you the most. If fatigue is troubling you, you may need to break up your exercise plan into several chunks throughout the day in order to make it more manageable. If you are finding it hard to sleep at night, you should not do aerobic exercises within two hours of bedtime. On the other hand, stretching and relaxation exercises before bed may help you get better sleep. So, where is the best place to exercise? That comes down to your own personal preferences and the exercise plan worked out by you and your doctor. Some people like to exercise in the comfort of their own home. Other people like to get out and go to a class or gym, finding it easier to stay motivated if they have the guidance of an instructor. Now it is time to get started. Set realistic short-term and long-term goals for yourself. Keep some sort of chart that tracks your progress. Identify those things that may be keeping you from reaching your goals. Stay motivated by exercising with a friend or family member, or by joining an exercise group or class. The Arthritis Foundation provides a variety of programs for people suffering from arthritis. These programs are designed for patients of all fitness levels - with exercises that can be done while sitting, standing, or lying on the floor. The Aquatic Program, Tai Chi Program, and Exercise Program are among the offerings of the Arthritis Foundation. Get in contact with your local branch of the Arthritis Foundation to find out more information about programs and classes in your community. Having rheumatoid arthritis does not a life-sentence of pain and immobility. If you take action now and get moving, you can find that exercise is a cheap and fulfilling way to rid yourself of pain. American College of Rheumatology, "Exercise and Arthritis" Arthritis Foundation Programs Mayo Clinic, "Exercise helps ease arthritis pain and stiffness" Wiley-Blackwell, "Aerobic exercise safe and effective for rheumatoid arthritis patients," 6/24/2010 Wiley-Blackwell, "Exercise program improves symptoms in arthritis patients," 1/4/2008 European League Against Rheumatism, "Obesity adds to the quality of life burden of rheumatoid arthritis," 6/14/2007 Arthritis Foundation, "Physical activity is natural pain reliever for arthritis," 4/8/2008 Ralph S. Paffenbarger, Jr., et al. "Physical Activity, All-Cause Mortality, and Longevity of College Alumni." The New England Journal of Medicine. March 6, 1986.